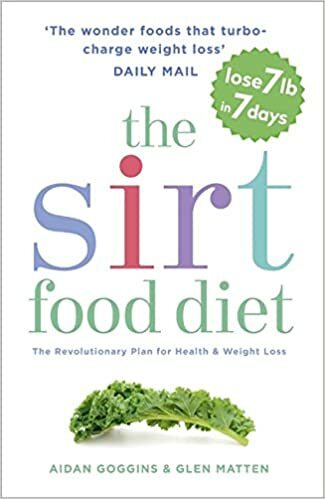 The Sirtfood Diet, A Health Revolution! Low carb… gluten-free… paleo… What separates a fad diet from a health revolution? Often the difference is in the science. Already an international bestseller in the UK and Australia, THE SIRTFOOD DIET by nutritional scientists Aidan Goggins and Glen Matten. This powerful breakthrough in health has been rigorously tested and verified by scientific studies from Harvard to Oxford and several international peer-reviewed trials. It has already attracted Hollywood stars and British royalty alike. Rather than focus on denying the food a reader loves, the diet promotes an increased intake of certain foods like wine, coffee, and even dark chocolate. These foods activate “sirtuin” genes inside all of us; these genes regulate metabolism, stimulate weight loss, and promote muscle growth. Research shows these foods belong to a special group of plant foods called Sirtfoods, which activate a family of genes in the body, called sirtuins – the same genes activated by fasting and exercise. Foods belonging to this wonderful group include walnuts, extra virgin olive oil, turmeric, strawberries, red wine, coffee, and dark chocolate. Nutritional medicine experts Aidan Goggins and Glen Matten tested a Sirtfood rich diet at their clinic in Britain’s most exclusive private members’ health club, KX, where members include Adele, Daniel Craig, Pippa Middleton, Madonna and several royals. Members experienced rapid fat loss of 7 pounds in 7 days, kept it off, and reported surges in wellbeing and energy. Celebrity trainer Pete Geracimo, whose clients include Adele and Pippa Middleton, recommends THE SIRTFOOD DIET as their secret weapon. In his compelling foreword, Geracimo discusses his clients’ demand for satisfying food that fuels a jet-setter lifestyle, gets and keeps them at a healthy weight, and ensures vibrant health and energy. Filled with inspirational case studies, easy-to-make recipes, and a maintenance plan for prolonged success, THE SIRTFOOD DIET shows you how you can lose 7 pounds in seven days and keep it off, while gaining muscle. Harness the power of Goggins’ and Matten’s clinically-proven Sirtfood program to activate weight loss, reduce aches and pains, sleep better, improve mood, and cut the cravings. Aidan Goggins, BPharm, MSc NutrMed, became a pharmacist and nutritionist driven by his own quest to cure his rare autoimmune disease. One of Europe’s most influential health experts, he has an added passion for sports nutrition, and successfully advises many of the world’s most elite athletes. He is a prominent media health pundit and an award-winning and bestselling author. Glen Matten, MSc NutrMed, holds a degree in nutritional medicine and has run successful clinics across the UK for over a decade. He collaborates closely with medical doctors, attracts clients from all over the world, and works with a number of celebrities. He is an established writer, makes frequent forays into the media, and is recognized as one of the top influencers in the UK food industry.